A special edition of Tubeworker, an industrial bulletin by London Underground workers for London Underground workers, produced for an RMT reps' meeting on 6 May. This issue contains an article tackling the anti-migrant racism whipped up in the election, more on the "Every Job Matters" campaign against job cuts, a cleaners' column, plus your local and workplace stories. 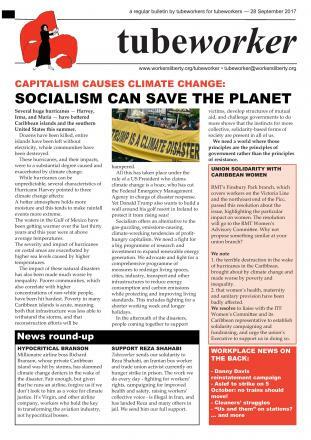 This issue has articles on the "Every Job Matters" dispute against job cuts, reinstatement campaigns, cleaners' struggles, as well as an article arguing that workers should vote Labour to kick out the Tories, but fight the Labour leaders for more radical policies. Plus, your local and workplace stories. This issue includes an article on the LU pay talks, Tubeworker's take on reinstating action in the "Every Job Matters" dispute, a stop-press update on the sacking of Karen Guyott, the latest on the reinstatement campaigns for Noel Roberts and Alex McGuigan, plus your local and workplace stories. This issue features an article on the use of cowboy cleaning companies to exploit cleaners on London Underground, the Greek election, news of RMT drivers ballot, and others news from the tube. This issue features an article on how to fight poverty, strategies for ongoing reinstatement campaigns, discussion of the unfair "preferencing" process for LU station staff, the regular cleaners' column, plus your local and workplace stories. This issue includes updates on the reinstatement campaigns for Vicky Hayward, Noel Roberts, and Alex McGuigan, a critique of Ukip's anti-working-class, racist politics, an interview with RMT Executive candidate Eamonn Lynch (and reasons why you should vote for him), plus your local and workplace stories. This issue includes a call for solidarity with the Kurds; info on the fights to win reinstatement for Vicky Hayward, Noel Roberts, and Alex McGuigan; the latest on the "Every Job Matters" dispute; plus your local and workplace stories. This issue discusses the need to take further action in the fight against staffing cuts and ticket office closures, the ISS cleaners' dispute, plus your local and workplace stories. This issue includes a five-point proposal for expanding the fight against job cuts and ticket office closures, news on the Central Line drivers' dispute, the latest on disputes at ISS and Sodexo, plus your local and workplace stories.